A simple but effective device for ensuring the occupants of a car are able to exit quickly and safely, particularly in the overturned car. The fixed blade allows the belt cutter to cut through the tough webbing of the seat belt and the protected blade prevents any injuries from the sharp blade. The wide handle enables the gloved hand easy grip and control of the cutter. Readily accessible and potentially life saving, the Seat Belt Cutter is used by Police, Fire and Ambulance services throughout the UK. Designed specifically with speed and efficiency in mind, the Seat Belt Cutter is a very popular safety device that can be used to cut through seat belts, clothing and many other restraining materials allowing casualties to be freed quickly and efficiently in emergency situations. Moulded from heavy duty ABS plastic, the Seat Belt Cutter includes a high quality angled STANLEY blade with an ergonomically designed hand grip allowing for a clean, accurate cut in situations where time is extremely limited. 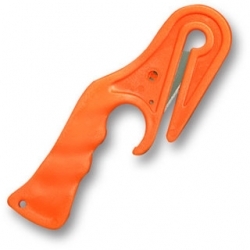 The Seat Belt Cutter is a very valuable and welcome addition to any portable emergency kit.